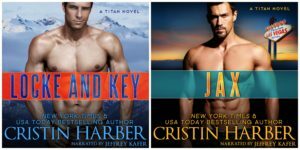 New Books in the Audible Romance Package - Audiobook News! I’m excited to announce that LOCKE AND KEY and JAX are now new books in the Audible Romance Package! If you are unfamiliar with Audible’s romance program, scroll down for an explanation. If you’re looking for direct links for the audiobooks on iTunes and Amazon, scroll to the bottom for retailer links! “Make peace with it.” And by “it” Locke Oliver’s boss meant her. Cassidy Noble was the reporter he never wanted to see again, the same woman he blamed for the hell his army unit had to endure so many years ago. His two options weren’t good. Not deal with his enemy #1 and let Boss Man bench him—or make nice. All Locke had to do was see what Cassidy was up to, who she was investigating, and he could keep his dream job. The plan was simple enough until her investigation leads them straight to the truth of his past and breaks open a wild international race to save lives, including hers. A motorcycle club princess and the daughter of a notorious gangster. She’s a straight-shooting single mom deadset on ridding a powerful motorcycle club of their South American drug cartel connection. But not all players are ready for the game to change, including the ones she can’t see. The CIA. Seven becomes an unexpected bargaining chip and Titan is forced deeper into the seedy world drug cartel glitz and Harley-riding MCs right. If you’re unfamiliar with Audible’s Romance Package, you may have heard it called Audible Unlimited or Listening Unlimited, as it’s similar to Kindle Unlimited. With the Audible Romance Package, you pay a low monthly fee and can check out as many romance novel audiobooks in the program as you want. You can also skip to the good parts (you know what I mean! ), search by categories like heat ratings or character archetypes. Need to know more? Check out my blog post about my first announcement of original / new books in the Audible Romance Package. Looking for Jax and Locke and Key on Amazon or iTunes instead?